*Spring 2018 Note: new grower profiles will be linked up soon ! On the grower side, we are privileged to work closely with the Lewis and Clark County Extension Office, offering growers a wealth of knowledge and resources. The growers gather together in true co-op fashion to ensure the season is “peppered” with a good variety of crops. Our growers are committed to bringing you the freshest produce in town – generally harvested the morning of the pick-up. You couldn’t ask for anything more unless you grew it yourself! The Hel ena Valley provides unique challenges to local growers. We support local growers as much as possible by buying their sustainably grown produce as it becomes available throughout the season. When necessary, we supplement the local growers produce with produce from the Western Montana Growers Co-op, especially in the early season. 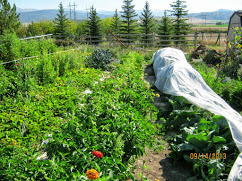 Meet our Helena Local Growers and Producers! ARE YOU INTERESTED in becoming a Grower for Helena Local? We are excited to explore the possibilities with you! Big or small, a few crops or a passion – let us help you share your locally & sustainably grown produce with locals! Helena Local is committed to high-quality, sustainable local food. Growers for Helena Local take the pledge below to grow in this manner, attend grower meetings, and allow vetting and site visits as needed. We prohibit synthetic herbicides, insecticides, fungicides on our crops, fields or livestock. We only allow synthetic fertilizers in the case of hydroponics (closed loop grow systems) and where run off mitigation is demonstrated. We take responsibility for our soil, water, and air quality with sustainable management practices, including cover crops, composts, crop rotations, mulching, crop diversity, perennial pastures and buffer strips. We prohibit chemically treated or genetically engineered seed; we use only organically, sustainably, locally or regionally produced seed whenever possible. We expect, unconditionally, that livestock be treated humanely. We use no hormones or antibiotic laces feeds or feeds of genetically engineered origin. We provide consistent access to pasture and fee from organic or sustainable and local or regional sources. We follow sanitary post-harvest practices, including proper storage, transport, and use of only potable water for washing. We constantly seek to enhance the biodiversity of native species on our land and to continually improve our land stewardship and conservation practices. We support and enhance the local economy by selling and buying locally as much as possible. We encourage local and seasonal eating to minimize food miles. We back the greater organic community and advocate for the ideals expressed in this pledge. We participate in our community encouraging and assisting farmers with sustainable practices, helping one another to be better producers and creating fertile ground. We are locally owned and operated. We provide safe, healthy working conditions and fair compensation for employees, farm staff and ourselves.